django-excel is based on pyexcel and makes it easy to consume/produce information stored in excel files over HTTP protocol as well as on file system. This library can turn the excel data into a list of lists, a list of records(dictionaries), dictionaries of lists. And vice versa. Hence it lets you focus on data in Django based web development, instead of file formats. The idea originated from the common usability problem: when an excel file driven web application is delivered for non-developer users (ie: team assistant, human resource administrator etc). The fact is that not everyone knows (or cares) about the differences between various excel formats: csv, xls, xlsx are all the same to them. Instead of training those users about file formats, this library helps web developers to handle most of the excel file formats by providing a common programming interface. 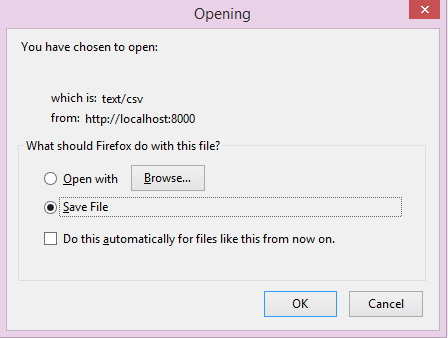 To add a specific excel file format type to you application, all you need is to install an extra pyexcel plugin. Hence no code changes to your application and no issues with excel file formats any more. Looking at the community, this library and its associated ones try to become a small and easy to install alternative to Pandas. In order to manage the list of plugins installed, you need to use pip to add or remove a plugin. When you use virtualenv, you can have different plugins per virtual environment. In the situation where you have multiple plugins that does the same thing in your environment, you need to tell pyexcel which plugin to use per function call. For example, pyexcel-ods and pyexcel-odsr, and you want to get_array to use pyexcel-odsr. You need to append get_array(…, library=’pyexcel-odsr’). Contrary to Django’s philosophy of ‘battery included’, django-excel does not come with all batteries due to the size of the dependency(xlwt, openpyxl, odfpy). Hence, Django developer is left with the choice to install and load the excel file formats. If you are an individual, you are welcome to support me too on patreon and for however long you feel like. As a patreon, you will receive early access to pyexcel related contents. And your issues will get prioritized if you would like to become my patreon as pyexcel pro user . The test application is written according to Part 1, Part 2 and Part 3 of django tutorial. If you should wonder how the test application was written, please visit django documentation and come back. You have 9 unapplied migration(s). Your project may not work properly until you apply the migrations for app(s): admin, auth, contenttypes. The 9 unapplied migration(s) were ignored because migrations are out of scope in this tutorial. Choose an excel sheet, for example an xls file, and press “Submit”. You will get a csv file for download. UploadFileForm is html widget for file upload form in the html page. Then look down at filehandle. It is an instance of either ExcelInMemoryUploadedFile or TemporaryUploadedExcelFile, which inherit ExcelMixin and hence have a list of conversion methods to call, such as get_sheet, get_array, etc. For the response, make_response() converts pyexcel.Sheet instance obtained via get_sheet() into a csv file for download. Please feel free to change those functions according to the mapping table. 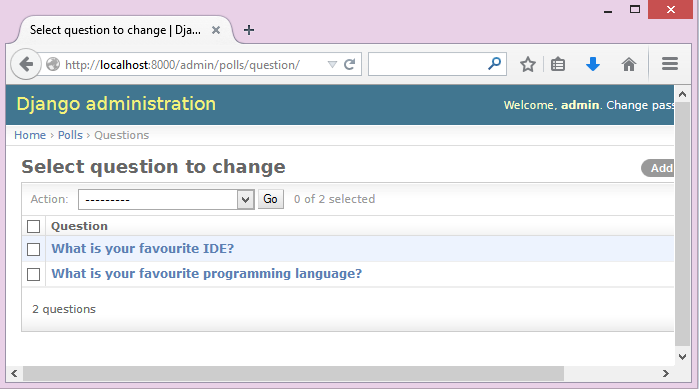 Except the added “slug” field, Question and Choice are copied from Django tutorial part 1. Please then select sample-data.xls and upload. And you get the following excel-alike table in response to confirm all were imported. pyexcel-handsontable along with pyexcel v0.5.0 brings excel-alie table rendering feature. Let me explain how this view is done a few paragraphs later. You may use admin interface to delete all those objects and try again. The custom initialization function is needed when the data from the excel sheet needs translation before data import. For example, Choice has a foreign key to Question. 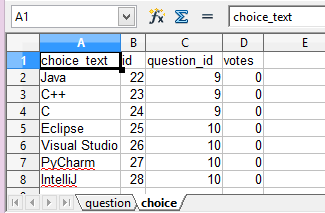 When choice data are to be imported, “Question” column needs to be translated to a question instance. In our example, “Question” column in “Sheet 2” contains the values appeared in “Unique Identifier” column in “Sheet 1”. make_response_from_tables() does all what is needed: read out the data, convert them into xls and give it the browser. And what you need to do is to give a list of models to be exported and a file type. 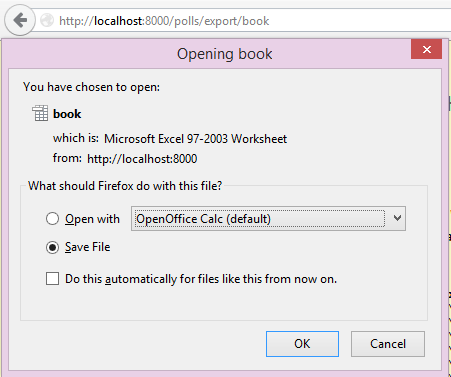 As you have noticed, you can visit http://localhost:8000/polls/export/sheet and will get Question exported as a single sheet file. In previous section, you have seen the rendering of the excel-alike table. First of all, the credits goes to handsontable developers. 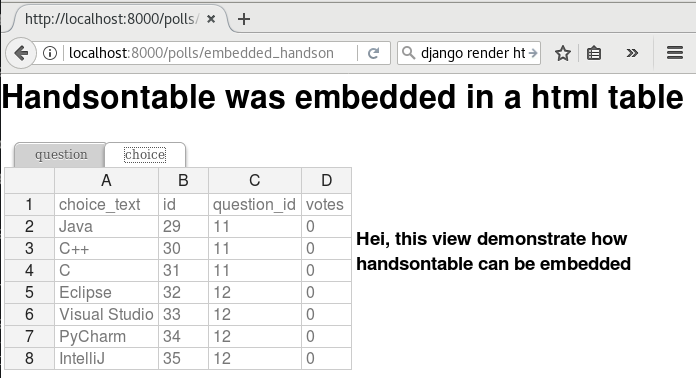 pyexcel-handsontable as renderer plugin to pyexcel v0.5.0 bring it to pyexcel developers. Here is how it is done. Simply put in ‘handsontable.html’ instead of ‘xls’ as file type. Those views can be accessed as http://localhost:8000/polls/embedded_handson_view/ and http://localhost:8000/polls/embedded_handson_view_single/. Previous example shows how to import a multi-sheet book. However, what exactly is needed to import only one sheet instead? 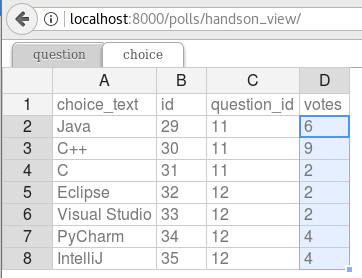 Before you proceed, please empty question and choice data using django admin. 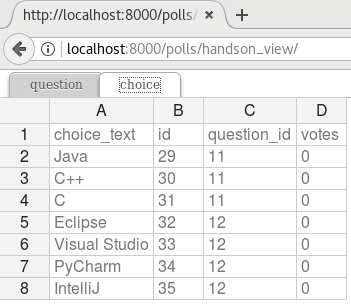 Let’s visit this url first http://localhost:8000/polls/imports_sheet/, where you see a similar file upload form. This time please choose sample-sheet.xls instead. Then look at django admin and see if the question data have been imported or not. Because it is a single sheet, the function to call is save_to_database() where you specify a model and its mapping dictionary. Have you noticed the extra parameter ‘name_columns_by_row’? Why is this needed? Well, normally you will not need that if you have column names in the first row. In this example, the column names appears in the second row. Please open sample-sheet.xls and have a look. The straight answer is because the column names in the data appears in the 2nd row of the data matrix. Warning: Bulk insertion got below exception. Trying to do it one by one slowly. 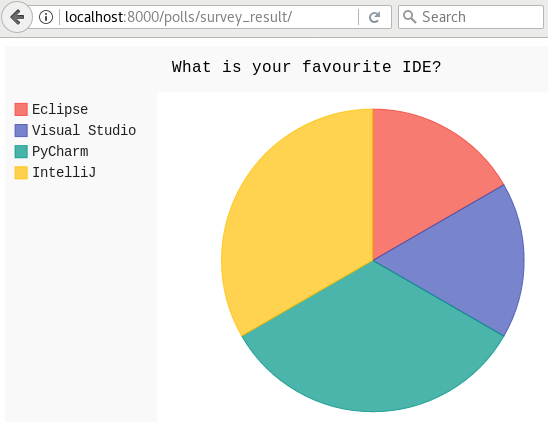 What is your favourite IDE? In order to remove those warnings, what you can do is to empty all data using django admin and redo this single sheet import again. With new version pyexcel-io v0.1.0, you could provide the row initialization function that returns None in order to skip a row in your import data. Inside the initialization function, you could also do database update. As long as it returns None, django-excel will try to do bulk create the import data. Let’s go to the admin page and update some votes for the choices. django-excel attaches pyexcel functions to InMemoryUploadedFile and TemporaryUploadedFile. Hence, the following functions are available for the uploaded files, e.g. request.FILES[‘your_uploaded_file’]. similar to save_to_database(). But it requires less memory. similar to save_book_to_database(). But it requires less memory. This requires column names must be at the first row in each sheets.